Around the league, players protested during the national anthem in different ways—some players locking arms with the team owner, some players taking a knee, some players not taking the field at all. With his latest comments and tweets, President Donald Trump has reignited the controversy over NFL players kneeling in protest during the National Anthem. Trump called for players to lose their jobs if they sat or knelt during the playing of the anthem before the start of the game. Across the league on Sunday, players and owners showed acts of solidary, with many locking arms while standing or kneeling on the sidelines. Below, a comprehensive team-by-team look at which players on each franchise protested. 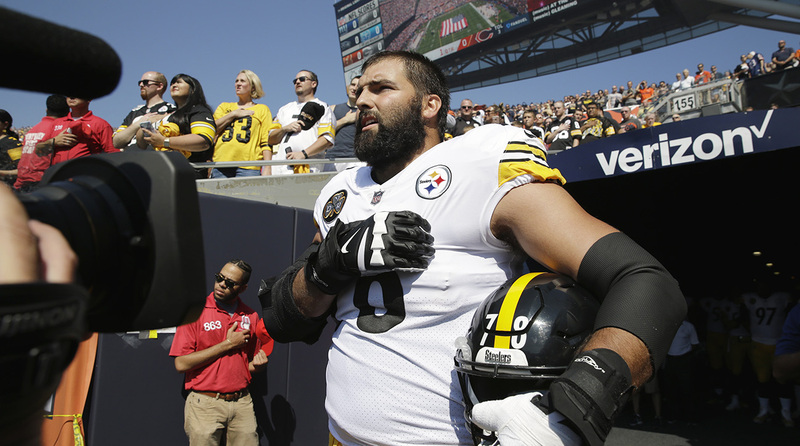 Pittsburgh Steelers left tackle Alejandro Villanueva was the only member of the active squad to appear near the field before the playing of the national anthem. Head coach Mike Tomlin along with offensive coordinator Todd Haley, offensive line coach Mike Munchak and running backs coach James Saxon were seen on the sidelines during the anthem. Villanueva, who was an Army Ranger and served in Afghanistan, stood near the tunnel with his hand over his heart. Before the game, Tomlin told CBS Sports that the team would not stand on the sidelines for the anthem. "We're not going to play politics," Tomlin said. "We're football players, we're football coaches. We're not participating in the anthem today -- not to be disrespectful to the anthem, but to remove ourselves from the circumstance. Many NFL and executives have chosen to comment regarding President Trump's comments on NFL players and their desire to sit for the anthem. "People shouldn't have to choose. If a guy wants to go about his normal business and participate in the anthem, he shouldn't be forced to choose sides. If a guy feels the need to do something, he shouldn't be separated from his teammate who chooses not to," Tomlin said. Carolina Panthers defensive end Julius Peppers was the only player not seen on the field before the national anthem before Sunday's game against the New Orleans Saints. The rest of the appeared of the players stood on the sideline during the anthem. Peppers later appeared on the field after the anthem. President Donald Trump's comments on Friday calling for players to be fired for those who wanted to participate in national anthem protest met with swift reaction with most of the league's team executives putting out statement condemning the comments. More than 3/4 of the league's owners have mad a statement regarding Trump's comments. Panthers owner Jerry Richardson has not made a statement, but former NFL commissioner Paul Tagliabue, who attended Sunday's game called Trump's comments "disgraceful." “To single out any particular group of players and call them SOB’s, to me that is insulting and disgraceful. So I think the players deserve credit for what they do,” Tagliabue said. 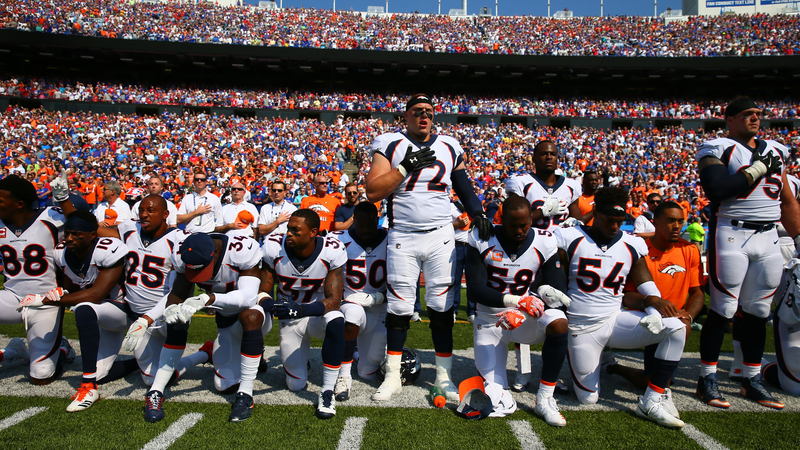 A large portion of the Denver Broncos, including stars Von Miller and Demaryius Thomas, kneeled during the national anthem before the team's game against the Bills on Sunday. On Friday night, president Donald Trump said NFL owners should "fire" NFL players who protest the anthem and referred to them as "son of a b----." His comments have been criticized by multiple NFL owners, players and the commissioner. Players have responded with a number of different protests and signs of solidarity; most teams have linked arms during the anthem, while a number of players kneeled. Broncos defensive tackle Derek Wolfe said on Saturday that he stands in honor of the military, and asked why people stay in the United States if they do not think it is the best country in the world. The Pittsburgh Steelers opted to stay in the locker room during the anthem. 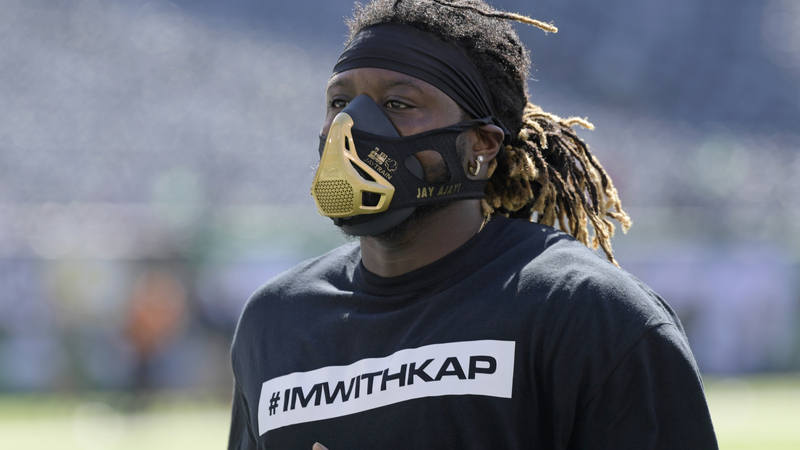 In the wake of Donald Trump's controversial comments which breathed new life into the national anthem protest debate, Miami Dolphins players wore black shirts with #IMWITHKAP on them. The shirts are a sign of solidarity with Colin Kaepernick, the former 49ers quarterback who sparked a nation-wide debate when he decided to sit during the national anthem to protest racial injustice in America. Dolphins players linked arms during the anthem, with owner Stephen Ross joining them. Ross released a statement criticizing Trump's comments and supporting his players on Saturday. A number of Dolphins players did kneel, including Laremy Tunsil, Maurice Smith, Julius Thomas and Kenny Stills. On Friday night, Trump said NFL owners should "fire" NFL players who protest the anthem and referred to them as "son of a b----." His comments have been criticized by multiple NFL owners, players and the commissioner. Widespread protests are expected across the NFL in defiance of the president. The New York Jets' acting owner, Christopher Johnson, linked arms with Jets players during the national anthem before the team's game against the Dolphins on Sunday. Johnson is the brother of Woody Johnson, the owner of the Jets who was appointed by Trump to serve as the ambassador to the United Kingdom. "It was an honor and a privilege to stand arm-in-arm unified with our players during today's National Anthem," Johnson said in a statement. "We are very proud of our players and their strong commitment to work in our community to make a positive, constructive and unifying impact." A number of Bills players kneeled during the national anthem before the team's game against the Broncos on Sunday, while star LeSean McCoy kept on stretching during the anthem. Bills owners Terry and Kim Pegula released a statement saying the team met to discuss the comments, and called Trump's remarks "divisive and disrespectful to the entire NFL." McCoy himself had strong words for Trump. Pittsburgh Steelers opted to stay in the locker room during the anthem. Members of the Jacksonville Jaguars knelt for the playing of the national anthem during Sunday's game in London against the Baltimore Ravens. The protest comes days after President Trump called for players to lose their jobs should they sit or kneel during the playing of the anthem. At least a dozen Jaguars players knelt for the anthem, including cornerback Jalen Ramsey, rookie running back Leonard Fournette and defensive end Calais Campbell. Players from both teams stood during the playing of "God Save the Queen" with team members linking arms during the song. Jaguars owner Shad Khan linked arms with Jaguars tight end linebacker Telvin Smith. Khan would reportedly donated $1 million to Trump for his campaign said that the team would not have any statement regarding what Trump said and instead referred to the league statement. "Commissioner Goodell's statement speaks for Mr. Khan and the Jaguars," team spokesman Jim Woodcock. Goodell said that Trump's comments were "divisive," revealing an "unfortunate lack of respect" for the league and the contributions that the players make in their communities. 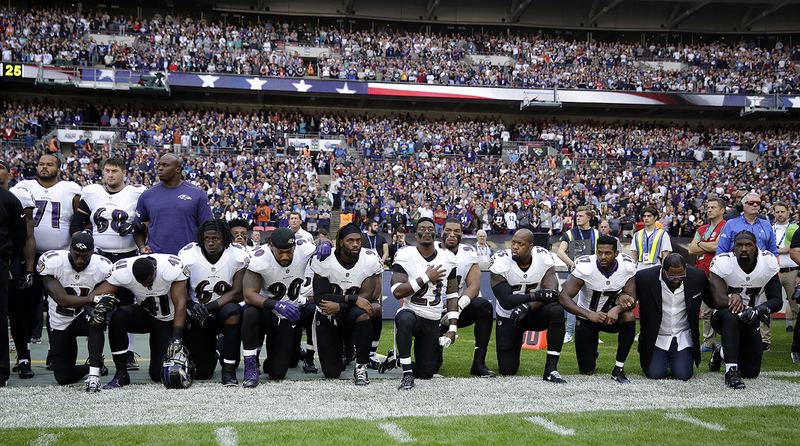 Several members of the Baltimore Ravens took a knee during the national anthem before the team's game in London against the Jacksonville Jaguars. Linebackers Terrell Suggs, C.J. Mosley and Za'Darius Smith, safety Tony Jefferson, wide receiver Mike Wallace, Lardarius Webb were among those who took a knee in protest of comments made by President Trump on Friday. Former Ravens linebacker Ray Lewis also participated in the protest. Trump called for players to be fired and encouraged fans to walk out of stadiums if players protested. He also wanted the league to also suspend players who refused to stand for the national anthem. "Wouldn't you love to see one of these NFL owners, when somebody disrespects our flag, to say, 'Get that son of a b---- off the field right now. Out. He's fired! He's fired!" Trump said. Ravens owner Steve Biscotti joined more than a dozen other teams that have commented on the protest or Trump's comments. More than a dozen NFL teams have either condemned the comments or referred to NFL Commissioner Roger Goodell's statement in which he called Trump's rant "divisive." Biscotti did not refer to Trump in his statement but said, "We recognize our players' influence. We respect their determination and support them 100 percent. All voices need to be heard. That's democracy in its highest form. " 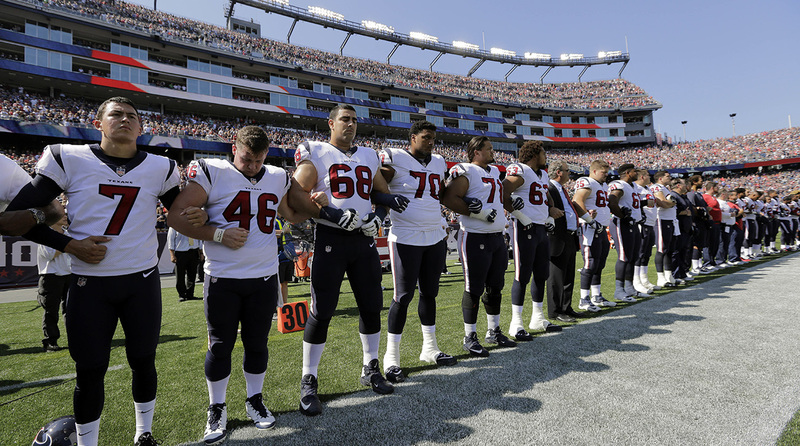 Houston Texans players locked arms and stood side-by-side during the playing of the national anthem before their game against the New England Patriots on Sunday. The team's chief operating officer, Cal McNair, joined the players on the sidelines. "The NFL specifically, and football in general, has always unified our communities and families," Texans owner Bob McNair said in a statement. "The comments made by the President were divisive and counterproductive to what our country needs right now. I hope the reaction from our players results in positive action for our league, our communities and our country as a whole to make a positive difference in our society." "Texans players are caring, intelligent men who do so much good, as was shown in the past month when our city was devastated by Hurricane Harvey," McNair continued. "I have never been more proud of our players and our team than during this time. It was a display of what is truly possible when we all work together. We will continue to support our players to work together to promote the values of respect and unity." New England Patriots cornerbacks Stephon Gilmore and Malcolm Butler were among several players who took a knee during the playing of the national anthem before their game against the Houston Texans. More than a dozen Patriot players kneeled and locked arms. Fans began to boo the players before the anthem and continued after the anthem was over. Earlier in the day, Patriots owner Robert Kraft said he was "deeply disappointed" with comments made by President Donald Trump on Friday. Trump called for NFL players who did not stand for the anthem to be fired and fined for disrespecting the flag. Members of the Philadelphia Eagles locked arms for the national anthem before Sunday's home game against the New York Giants. Eagles Chairman and CEO Jeffrey Lurie also participated in the pre-game anthem and stood next to Eagles cornerback Malcolm Jenkins and linebacker Brandon Graham. Dozens over NFL players and nearly every franchise has commented on President Donald Trump's comments concerning players kneeing for the national anthem. Trump said those players should lose their jobs and be fined for disrespecting the flag. 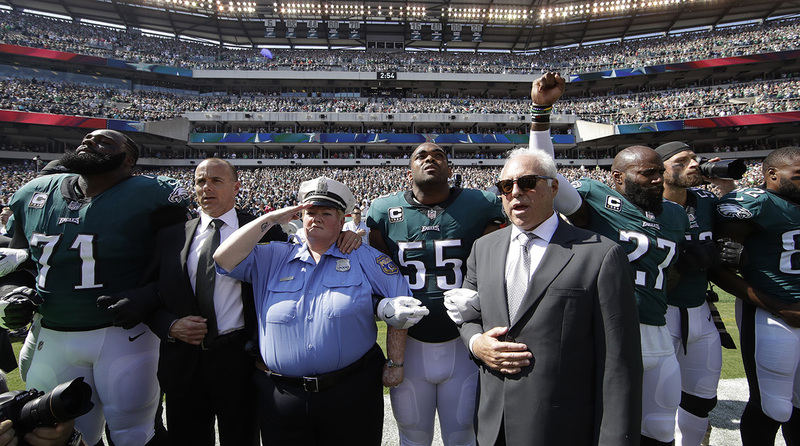 "The best of us lend our compassion and determination to the aid of others," Eagles Chairman and CEO Jeffrey Lurie said in a statement on Saturday. "Every day I see the genuine dedication and hard work of our players. And I support them as they take their courage, character, and commitment into our communities to make them better or to call attention to injustice. Having spoken with our players, I can attest to the great respect they have for our national anthem and all it represents. We at the Philadelphia Eagles firmly believe that in this difficult time of division and conflict, it is more important than ever for football to be a great unifier." Three members of the New York Giants took a knee during the playing of the national anthem before Sunday's game against the New York Giants. 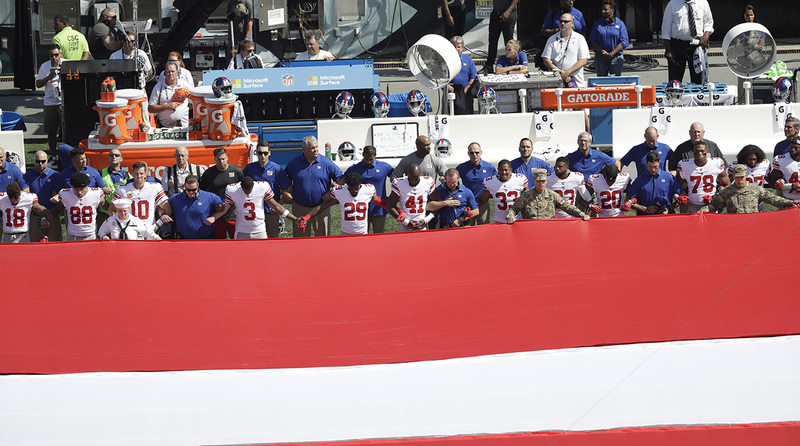 All-Pros Landon Collins and Damon Harrison and linebacker Olivier Vernon each chose not to stand for the anthem. The rest of the team and coaches locked arms during the anthem. On Saturday, Giants co-owners John Mara and Steve Tisch blasted Trump for his comments. Several members of the New Orleans Saints did not stand during the playing of the national anthem before their game against the Carolina Panthers. The 10 Saints sat for the anthem who sat for the anthem were: safety Rafael Bush, safety Kenny Vaccaro, safety Chris Banjo, defensive end Alex Okafor, defensive tackle Sheldon Rankins, defensive end Cameron Jordan, running back Adrian Peterson, running back Alvin Kamara, running back Mark Ingram and receiver Brandon Coleman. The New Orleans Saints issued a statement on Sunday responding President Donald Trump's comments about NFL players who take a knee or do not stand during the national anthem. Trump said those players should be fired for disrespecting the flag. "Our organization takes great pride in equality and inclusion and find the comments by the President disappointing and inappropriate relative to our players on this issue," the statement said. "Tom Benson served in the military and continues to this day to support all military branches and feels strongly that we honor those men and women who defend our freedoms and our freedom of speech. He also believes that the very players that represent the Saints and Pelicans organizations should be allowed to share or express their feelings. We prefer to take this moment in time and work together, all of us, to stop the divisiveness. Our players and our organization serve the New Orleans community selflessly and do so without care of race, creed or sexual orientation and that makes us a better city and a better team. We believe strongly in honoring our flag and the national anthem and what it represents and we support our players. We all must strive to show that we are all Americans and continue to work towards equality for all. The NFL and NBA, perhaps more than any sports, have the power to bring communities together." The Chicago Bears stood on the sideline with most of the team locking arms during the playing of the national anthem. Their opponent, the Pittsburgh Steelers, remained in the locker room or in the tunnel area while the anthem was played. The teams responded to comments made by President Donald Trump said said players should be fired and punished for not standing for the national anthem. The Chicago Bears are proud to support our players, coaches and all members of our organization to bring peace and unity together through football,” Bears chairman George H. McCaskey said.